Plantation shutters are your best option to give you a lot more control over your home. Compared to traditional curtains, they come in a variety of options with adjustable louvres offering greater variety in how much natural light you want in, while also giving you more say in the privacy of your home. Compared to blinds, they’re much easier to fit and less likely to lose their integrity over time. However, not all plantation shutters are the same. Besides the diversity of styles such as full height, café style, and layer-on-layer to help you fit shutters to any window or door, there are also different materials on offer. Vinyl plantation shutters are made of polyvinyl chloride plastic, called PVC for short. This is a lightweight material that’s significantly less expensive than wood, making vinyl a more cost-effective option for most homes. They are far from cheap, however vinyl is durable, able to resist scratches and marks that might otherwise mar wooden shutters. It’s also highly resistant to humidity, moist weather, and water. This means that it can be the perfect choice for environments where water is to be expected, such as the kitchen or the bathroom. It’s also an option for homes that tend to open up their doors to the outside more often. It’s not without its weaknesses, however, and with vinyl, “weakness” is the operative word. As lightweight as it is, it’s not best suited to covering larger windows without dividing rails to help provide additional structure to the material. If single pieces are too long, horizontally, it can cause the louvres to start sagging and bending. That said, if you get high-quality vinyl shutters fitted, then you don’t need to spend any time maintaining them beyond the occasional dusting. They’re long-lived, hardy, and sleek. Wood plantation shutters, on the other hand, can take a little more work. As with all wood furniture, they need to be re-finished and re-varnished from time to time in order to keep them up to standard. 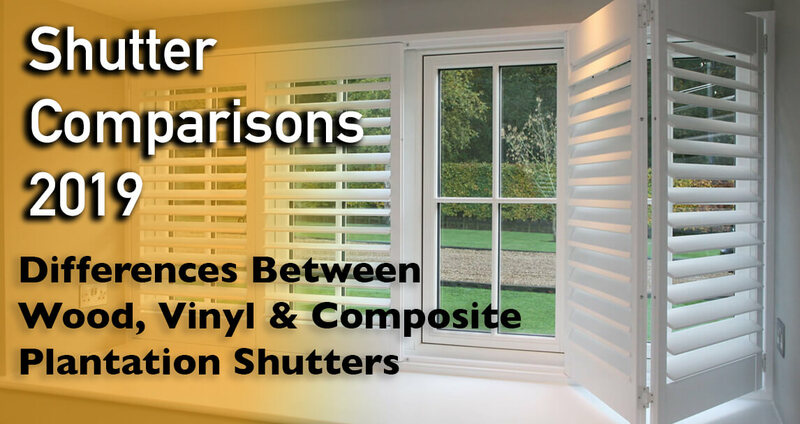 They are also the most expensive shutter options available and they lack the waterproof quality of both vinyl and composite shutters. But they have plenty of advantages all their own. For one, wood is significantly stronger than vinyl, making it a better fit for long, single units that don’t require any additional supports. The natural aesthetic of wood is a huge selling point, too. Though both vinyl and composite shutters come with wood grain designs, a closer look at them makes it clear they’re not the real thing. While wood needs more work to last longer, it is also a lot more versatile. It can be repainted and re-varnished every time you want to change its look or its colour. There are a lot of different woods to choose from, each with their own properties, strengths and weaknesses. For that reason, it’s worth taking a closer look at the differences between teak and basswood, timber and hardwood, and so on. Composite plantation shutters provide a middle ground between wood and vinyl. They’re made of faux wood, which is a mix of different grains alongside wax to give it a very similar strength to pure wood but at a lower cost. This faux wood is then covered with PVC. the same material that vinyl shutters are made of. Because of that blend, composite plantation shutters have a mix of both the other options’ qualities. While it’s as sturdy and has the same structural integrity as wood shutters, it also has the waterproof, humidity-resistant qualities of vinyl, while being just as easy to maintain. It’s a cost-effective alternative to wood, but it still has a few weaknesses of its own. Unlike wood shutters, composite shutters can’t be repainted or redesigned once they’re fit and while you can choose a wood grain design for them, it still doesn’t have that authentic natural appeal that wood does. If you don’t mind a more contemporary look, however, it’s perhaps the most versatile variety of shutter available. Plantation shutters and wood blinds may seem like the same product, but there are significant differences between the two of them. If you are considering purchasing one of them, it is important to know the difference between the two. Both plantation shutters and wood blinds add a significant amount of class to your property. If you are after quality, then plantation shutters are the way to go. Although they are more expensive, you definitely get what you pay for as they can help create a noticeable (but very welcome) difference in your home. Which material is the best fit for your plantation shutters? There’s no one right answer. It all depends on you. Your budget, where you want to fit them, how large you need them, and the aesthetic you want all contribute to choosing the best plantation shutters for your home. Do you want the waterproof, low-maintenance option of vinyl? The natural appeal and integrity of wood? Or perhaps composite really is the best of both worlds? Take a closer look at the different plantation shutters we offer and see if you can’t find the perfect fit for your home. 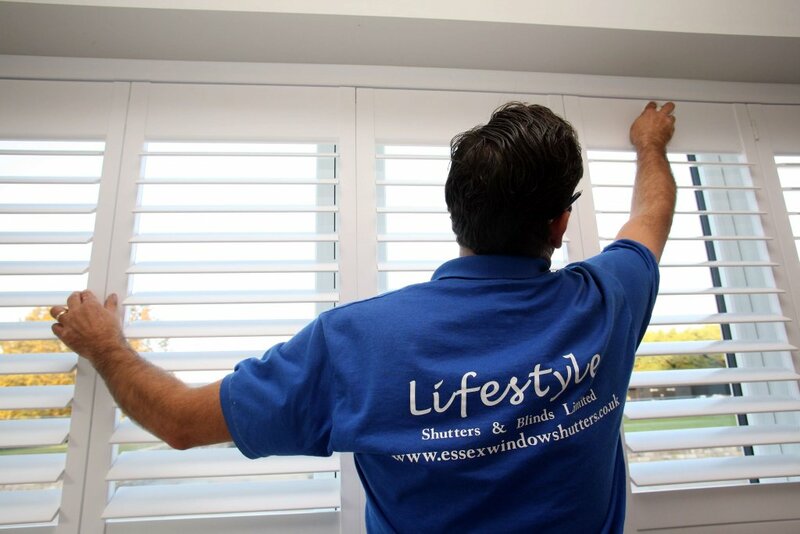 If you need help deciding, Lifestyle Shutters are here to help you. We’re are only a call away. How much per foot are your vinyl and plantation shutters.